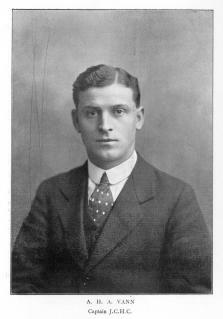 Arthur Harrison Allard Vann, attended Chichele’s College at Higham Ferrers and came up in 1909. Arthur's younger brother Bernard William Vann went on to become the only Jesuan to win a VC in the conflict and was killed in action in 1918. He was already a member of the college when Arthur came up, having matriculated in 1907. It is not known what Arthur did in the 7-year gap between leaving school and entering university at the age of 25. Once here he was a prominent member of the College and the University, taking part in several sports: hockey, association football, sculling and cricket. He particularly excelled at hockey, playing at centre forward for the ‘Varsity and trying out at international trials. When he was about to leave College in 1913 Chanticlere ran an article, along with the photograph above, about him. The article goes into great detail about him, telling us he lived at 65 Jesus Lane, he had curly hair, “a hesitating gait, and a curious impediment in his speech from which he derives his nickname (Baby)” (Chanticlere, Lent Term 1913, pp18-19). The article also comments on his academic ability, suggesting that other undergraduates could apply to him “for any information concerning Specials, at which he has never failed; it is also his proud boast that he was classed in the History ‘Mays’ of 1910”. He also played bridge, and never lost, was a member of many College Societies, and played both the mouth organ and the penny whistle. He died at the Battle of Loos. It was recorded in the newspaper on 13 October 1915 that he was one of the men “suffering from gas poisoning and missing” and his death, which probably took place on 25 September was not confirmed until much later. This probably accounts for the lack of an obituary about him in the Jesus College Society Annual Report, which might well have filled in some of the gaps in our knowledge.